No parent wants her child to grow up predisposed to the battery of health conditions that come with being overweight: type 2 diabetes, hypertension, high cholesterol. But finding ways to incorporate healthy habits into the child’s existing schedule can be difficult. Lucky for these busy parents, new research suggests family meals could be the antidote. Childhood obesity is rising fast in the United States. Data from the Centers for Disease Control and Prevention show 21 percent of kids ages 12 to 19 are obese. Thirty years ago, that rate was five percent, and a similar trend is happening among younger children, too. In 1980, seven percent of 6- to 11-year-olds were obese, but by 2012 that rate had jumped to 18 percent. Frustrated dieticians have recommended the same advice for decades, and now researchers are searching for ways to implement it. Family meals are a good place to start, says lead author of a recent study Jerica Berge. “I was surprised by how consistent the patterns were,” Berge, a psychologist and researcher at the University of Minnesota, explained to Time. Kids whose family meals were punctuated by conversations on personal health tended to follow through with their parents’ recommendations when they were made in a positive light. In other words, kids who learned they’d be big and strong fared better than kids who got lectured on not gaining weight. Her team’s investigation included 2,287 people plucked from a 10-year longitudinal study examining weight-related variables among kids. They measured a host of factors that could influence how much weight a child gains simply through how she eats her food. They looked at meal duration, average number of people at the table, the type of conversation that filled the meal, and how often (and for how long) awkward or uncomfortable pauses followed discussions on food. By and large, kids who ate with their families tended to be of a healthier weight, stay at the table longer (18.2 minutes over 13.5 minutes), have more people at the table, and talk about food in more positive ways and with fewer awkward pauses. For Berge, this was clear evidence the structure of a meal can heavily influence a child’s long-term health. "It is important to identify modifiable factors in the home environment, such as family meals, that can protect against overweight/obesity through the transition to adulthood,” she said in a statement. Not all experts see the family meal dynamic as one of choice. A recent study from North Carolina State University found the pressures middle- and low-income mothers faced to save money, from standing in long lines at the food pantry to skipping meals themselves, made feeding their children at all the top priority. Even for mothers who could afford to buy food on a regular basis, meal planning remained a challenge. “We rarely observed a meal in which at least one family member didn’t complain about the food they were served,” co-author and NC State associate professor of sociology Sinikka Elliott told Medical Daily. Even the most hardline critics, who may claim That’s what parenting is, will probably sympathize with the mother who struggles to make nutrition, structure, and satiety all work together. Sometimes two of the three is enough, particularly as low-income parents tend to work odd, unpredictable hours. Unfortunately, being the most cost-prohibitive of the three, nutrition is the one that gets the axe. Another luxury some families can’t afford is preparing meals in bulk, due to the necessary upfront costs. Many of the mothers in Elliott’s study reported buying the same unhealthy processed foods week after week because they were afraid of wasting money on foods no one liked. She also expressed concern over Berge’s study, pointing out that family meals may actually be the result of kids being healthier, not the other way around. In this scenario, lower-income families have even less choice. 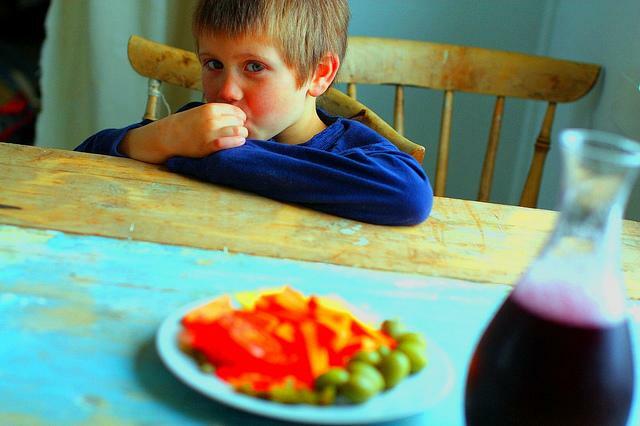 Healthier kids ask for lean protein and vegetables, while finicky overweight kids plead for grease. Wanting their children to be fed, parents relent. The upshot for families struggling to maintain nutrition and economics may be in keeping consistent. When Berge and her team looked at the impact table population had on kids’ health, they found the addition of one more person helped kids to eat better: a sign reinforcement of the rules helped. Suddenly kids were outnumbered, meaning a positive attitude toward food was coming from two grown-ups, not just one. In many cases this was the father, but in single-parent homes it could be an older sibling or a relative. “It might be a matter of having one more person at the table for crowd control, another person to help make the meal and be a model for children to emulate,” she told Time. That way, kids aren’t given a choice between nutrition or structure. The one-two punch delivers both, and in a way that keeps them practicing healthy habits for life. Source: Berge J, Wall M, Hseuh T, Fulkerson J, Larson N, Neumark-Sztainer D. The Protective Role of Family Meals for Youth Obesity: 10-Year Longitudinal Associations. Journal of Pediatrics. 2014.